Even with the best antivirus and firewalls in place, attackers do get in — and when they do, how will you respond? You need a solution that not only detects threats, but enables you to respond quickly and shut them down. 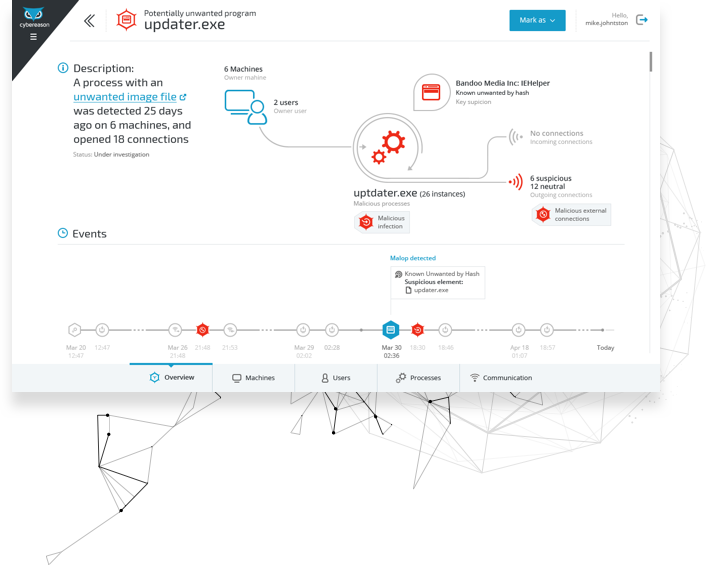 Deep Respond, the Cybereason response interface, presents an easy-to-understand visual attack story with insight into what active malicious operations are currently underway. After quickly understanding the situation, you can easily stop threats with single-click remediation. That includes isolating machines, killing processes, quarantining files, deleting registry keys, and more. In addition, you can automatically block process execution and prevent network communication.